No such thing as MG! Our porters on the journey are all from the local tribe of Pemon Indians. Pemon translates literally as ‘human being’ which seems both proud and modest at the same time and entirely in keeping with the individuals in our group. Manuel, tells me that when the writers of ‘Up’ visited Roraima to research the story, they were so impressed by the Pemon guides that they wrote the characters of the dogs to represent each of their porters. Separated by language, culture and a great deal of western privilege, communication is basic and infrequent though I would dearly like to know more about them. Manuel seems to cross the gulf easily, a native Venezuelan who has lived in the region for many years, he speaks their language and they clearly hold a great deal of liking and respect for him. I am therefore delighted when he calls me over to demonstrate the portable magic trick that I have found indispensable on all my journeys. I am less delighted to discover that Manuel has bigged me up by telling them I am a great shaman in my own tribe and that I have come to demonstrate my magic to them. The look on their faces tells me this will be a tough room. The trick, however, never fails to work its magic, there is laughter, smiles and high fives all round and it seems that a tiny chink might have been made in the wall between us. 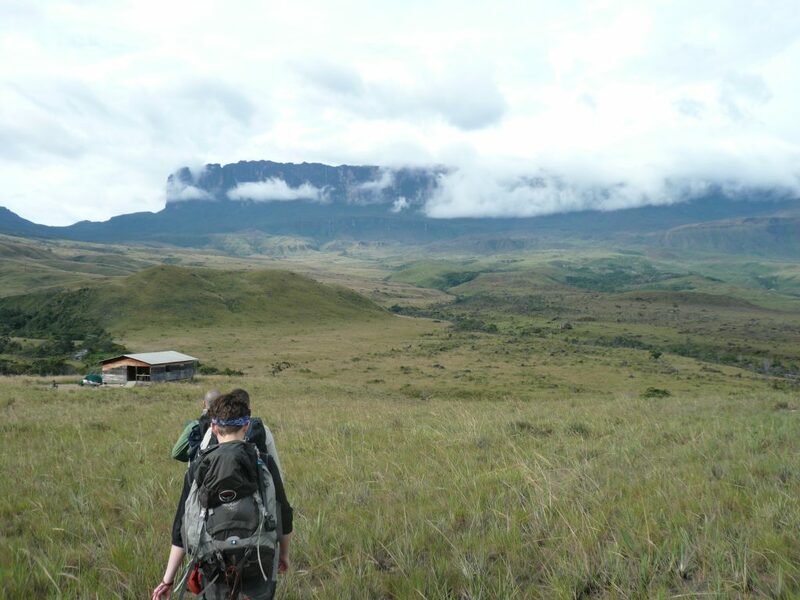 The top of a Tepui mountain is about as rare and delicate an ecosystem, as anyone could find. One of the key considerations for tour groups operating in the area, therefore, is the policy of ‘leave no trace’. This involves ensuring that every last piece of rubbish is collected, stored and brought back down the mountain at the end of our stay and this includes every last bit of our poop. For the last three days since we reached the summit we have been required to poo religiously into plastic bags which are then sprinkled with lime and tied off. Every member of our group has acquired their own personal sh*t kit of plastic bags, baby wipes and hand gel and have become quite proficient in their use whilst clutching a torch and squatting in the near blackness. By the end of three days we have accumulated a large and evil-smelling pile of plastic bags in the corner of the toilet cave. The man whose job it is to collect these bags and carry them down the mountain to be buried is the chocolate porter, Pepito, in my opinion, a hero of epic proportions. (You may disagree but then you haven’t seen this pile). In return for completing this noble and herculean task, I am told, Pepito will be paid a little bit more than the others. However much it is, it can never be enough to express my gratitude for not having to do it myself. Chocolate porters of the world, I salute you.